What would you do if your father was responsible for killing thousands of people during World War II? It would be one thing if this man was a soldier who had excelled during battles, killing opposing soldiers for the good of his country. In Monika Hertwig�s case, the reasons for her father�s fame are about as far from honorable as you can get. We meet Monika and hear her compelling story in director James Moll�s Inheritance, a riveting documentary that tugs at our heartstrings and leaves us with many of the same moral questions that she has to struggle with every day. Docurama Films brings the film to DVD in fine fashion, with a few extra features also along for the ride. Monika Hertwig lives a normal life in Germany with her husband, caring for her granddaughter like she was her very own. Monika�s heritage isn�t a normal one, however, as her father was Amon Goeth, a prominent Nazi leader who was commandant of the Plaszow concentration camp, where he murdered thousands of prisoners. While she never knew her father, an initial viewing of Steven Spielberg�s 1993 film, Schindler�s List, changed her life. Upon seeing Ralph Fiennes performance as her father, Monika felt like she finally knew the man well, and, needless to say, she didn�t like what she learned. Seeing the film also led Monika to seek out Helen Jonas, a survivor of her father�s Plaszow camp who was enslaved under him when she was a young girl. Their first meeting changes both of their lives forever and is an amazing study in forgiveness and the power of human emotion. The segment where we hear Monika reminisce about her first screening of Schindler�s List is beyond compelling. Moll�s ability to actually use footage from Spielberg�s film in his own is great, to begin with, but as Monika goes on about how Ralph Fiennes� performance haunted her, we are totally engrossed in what she is saying. We then switch to Helen�s point of view and she comes across as an understanding, forgiving woman with the kindest of hearts. It�s truly amazing what this strong woman has been through since she was only a little girl, yet she has more strength than most of us only dream of having at any age. The centerpiece of the film is the eventual meeting between Monika and Helen and it is a truly unforgettable film experience. Helen is in the unique position where she has every right to be angry at Monika for what her father was. Before their encounter it�s clear that she had to make a decision to either be vindictive and angry or be entirely forgiving and act as the only person who can truly help Monika deal with her own anger following the revelation of her father�s true nature and the horror he bestowed upon Helen�s life. When they do first see each other, Monika�s reaction is heartbreaking, and is one of the most memorable single scenes I�ve ever seen on film. Not only is the two ladies� dialogue during their initial meeting an unforgettable experience, but Moll also takes us on an amazing journey through some of the actual buildings we first visited in Spielberg�s masterpiece. One of these actual sites is the location that the two women first meet each other, and having them talk with each other there only adds to the emotional impact. Near the end of the film we see something totally unexpected (which I won�t spoil here), that will haunt you long after the film is finished. The most haunting aspect of this surprise though is the fact that Monika saw this same disturbing thing long before we did, and it surely gives her much more trouble sleeping than it does us. Image Transfer Review: The 1.78:1 anamorphic widescreen presentation is very impressive, featuring flawless lighting and fine image detail. The location footage looks amazing, with every intacricy of these old places presented beautifully. There�s nothing in the form of grain, dirt, or other blemishes. Audio Transfer Review: The Dolby Digital 2.0 audio is a nice mix that works well with a film that relies mostly on dialogue. The score blends in nicely with the speech, though, with seamless transitions throughout. Interview with the director and cinematographer. Extras Review: There are a few extras including a five-minute interview with the director and cinematographer, during which Moll explains how the possibilities that the film�s subjects should meet came about. We also take a look Behind the Score for six minutes, as we get a look at the actual recording of the score for the film. 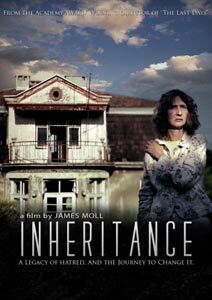 Also here is a bio of director/producer James Moll, the trailer for Inheritance, and previews for other DVDs available from Docurama Films. 2006�s Inheritance is an under-the-radar documentary that practically fell into the lap of filmmaker James Moll. What he does with a first meeting between a concentration camp survivor and the daughter of her captor is an amazing feat, resulting in one of the best documentaries of the last few years. Docurama�s DVD is a nice effort, complete with solid audio and video presentations.